WelCom July 2017: In June 2016, Pope Francis issued a new decree that elevated the liturgical celebration honouring St Mary Magdalene from a memorial to a feast, putting her on par with the Apostles. 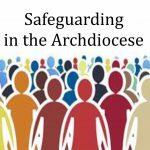 The reason, according to Archbishop Arthur Roche, Secretary of the Vatican’s Congregation for Divine Worship and Discipline of the Sacraments, when explaining the papal decision last year, ‘is that she has the honour to be the first witness of the Lord’s resurrection. It is right that the liturgical celebration of this woman should have the same rank of Feast as that given to the celebration of the apostles in the General Roman Calendar. Pope Francis’ decision to elevate St Mary Magdalene’s memorial to a feast during the Jubilee of Mercy, he said, was done to emphasise the importance of this woman, ‘who so loved Christ and was so greatly loved by Christ.’ Noting how Mary Magdalene was the first eyewitness to the Risen Christ and the first to announce his resurrection to the apostles, Archbishop Roche hailed her as ‘the Apostle to the Apostles’. 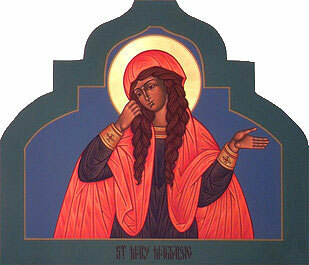 St Mary Magdalene’s feast day is on 22 July. 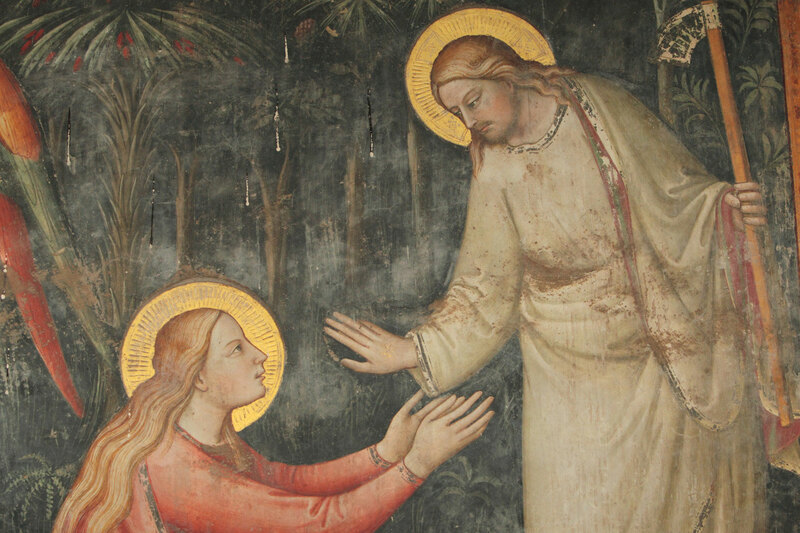 Mary Magdalene – or Mary of Magdala – was present with Christ during his public ministry, death and resurrection. Interpretations of her story and who she was have been shaped in many fashions over the centuries. Maria Magdalena, Piero di Cosimo (Italian artist, 1462–1521). There are several Marys in the New Testament: Mary the mother of Jesus; Mary of Bethany; Mary the wife of Clopas; Mary the mother of James and Joseph and the ‘other’ Mary; and Mary who came from the town of Magdala on the western shore of the Sea of Galilee. Last year Pope Francis raised the celebration of the latter Mary, Mary Magdalene, the first witness to the resurrection, to the rank of feast. Why did it take so long? After all, her news wasn’t ‘fake news’. She is the only person in the New Testament to realise that Jesus was alive and to testify to it. She put ‘two and two together’ before anyone else. She is the thread of continuity between Jesus’ ministry, passion, death and resurrection. Imagine that! Moreover, she is one of the few biblical women with her own identity, that is, she is not an appendage to or a chattel of her father, husband or brother. Sadly though, some real whoppers –‘alternative facts’ – have been told about her throughout history. Why? Basically, many Catholics, don’t know what the New Testament says about Mary Magdalene because we seldom hear her story on Sunday. 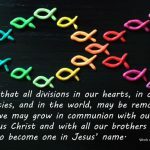 On the Sundays between Easter and Pentecost when it would be logical for her story to be proclaimed, we hear instead the stories of Thomas, Peter and the Beloved Disciple. Furthermore, John’s beautiful story (20:11-18) of Jesus’ encounter with a distraught Mary Magdalene in the garden and her commissioning is not in the Sunday lectionary at all, but relegated to a weekday (Easter Tuesday). It is, however, proclaimed on her feast day, 22 July. Mural depicting the yet risen Jesus Christ speaking to Mary Magdalene. Santa Maria Novella Church, Florence, Tuscany, Italy. Yet for Matthew, Mark and John, Mary Magdalene was one of a group of women at the foot of the cross. Luke doesn’t name her but records that women were present. For Matthew, Mark and Luke, she was among the women, the first witnesses to the resurrection. Matthew and Mark tell us that they were commissioned to tell of the resurrection. In Luke, while they weren’t commissioned, they told anyway but the disciples wouldn’t believe them. We hear one of these three accounts at the Easter Vigil every year. Thus, the gospel reading for the most important feast in the Church’s liturgical year is the story of the women going to the tomb and learning of the resurrection. According to John, it is Mary Magdalene alone who was the first witness to the resurrection and the first to be commissioned to tell of it. So the biblical record is very clear. It’s gospel! The distortion and confusion – the ‘alternative facts’ – about Mary Magdalene’s identity began in the fourth century. Mary Magdalene (Luke 8:1-3) began to be identified with Mary of Bethany (Martha and Lazarus’s sister). First, Mary of Bethany’s anointing of Jesus (John 12:1-8) was merged with the anointing of Jesus by an unnamed sinner (Luke 7:36-50). Next, Mary Magdalene became the unnamed adulteress (John 8:1-11) so that Mary Magdalene the disciple was now Mary Magdalene the whore. Third, at the end of the sixth century Pope Gregory the Great claimed that Mary Magdalene’s ‘seven demons’ (Luke 8:2) were the seven deadly sins. (For whatever reason, when men in the New Testament are possessed by demons we don’t associate them with sin.) Strangely, Mary’s ‘demons’ became sexual sins as well as sins of vanity and boldness. But the New Testament doesn’t call Mary Magdalene a sinner, let alone a prostitute. Unfortunately, the depiction of Mary Magdalene the repentant sinner has dominated much art, etc. Peter and Paul aren’t seen as repentant sinners yet surely, they deserve the designation. She didn’t confess to being a sinner as Peter did (Luke 5:8). Unlike Paul, Mary Magdalene didn’t persecute people nor, unlike Peter, did she deny knowing Jesus. Commentators don’t discuss what kind of sins Peter committed but assume that the sins of the woman who anointed Jesus in Simon’s house (Lk 7:36-50) are sexual ones –‘alternative facts’! Her ‘seven demons’ probably referred to physical illness. ‘Seven’ – the symbolic number for completeness – highlights the seriousness of Mary’s illness and the extent of her cure. Interestingly, Peter who sins (lies about not knowing Jesus) isn’t saddled with this baggage forever, while Mary Magdalene who doesn’t sin, gets enduring whoppers made up about her. The gospel accounts portray her as a devoted disciple, a courageous leader who ministers, mourns, honours and witnesses. Later she was called ‘apostle to the apostles’. What a woman! It’s her message we are called to proclaim with our lives whether people believe us or not: Jesus is risen! It’s not ‘fake news’! 1. Initiate the celebration of her feast in your parish. 2. 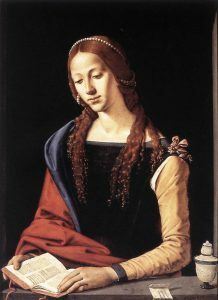 Donate/commission/produce an artwork depicting an upright and fully clothed Mary Magdalene for your parish or school. 3. If you are a poet/songwriter, compose a gospel-based poem/song. 4. When telling the story of Church, include the fact that Mary Magdalene was the one to whom the risen Christ appeared and whom he commissioned to announce the Good News to the others. 5. 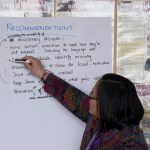 Separate Mary Magdalene from other Marys by keeping in mind this ‘negative’ but useful logic: the gospel writers frequently connect person and place, for example, Jesus with Nazareth, Joseph with Arimathea and Simon with Cyrene. Thus, when a Mary is not called the Magdalene, that is not who is intended.